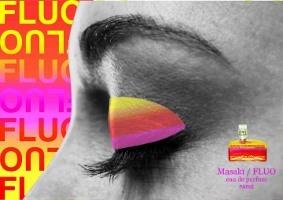 Masaki Matsushima has launched Fluo, a new fragrance for women. Like the brand's Masaki / Masaki, Fluo is inspired by New York City, where people of all colors and cultures can feel at home. Fluo was developed by perfumer Jean Jacques, and the notes for the fresh fruity fragrance include grapefruit, kumquat, passion fruit, peony, nectarine, lotus blossom and crystal musk. Maybe they’re thinking “fluo” is short for “fluorescent”? The colors of all those fruits and flowers would make a bright bouquet, almost as bright as the eye makeup and scent bottle in the photo. A very cool picture, by the way. I see it used frequently that way, albeit only in beauty & fashion — as short for fluorescent. Several youth-oriented fashion lines have done “fluo” collections. That must be it, then. I never got to try it! Hard to find that brand, Sephora usually only has a few. New York city? The name and picture make it seem as though it were influenced by nu rave culture. Fluo-rescent. Exactly. Wouldn’t be a bad idea. Sounds like a fruit smoothie.